Marine scientists say the case for a moratorium on the use of heavy trawling gear in deep waters is now overwhelming and should be put in place immediately. A new report prepared for the UN indicates the equipment is doing immense damage to the ecosystems around seamounts, or underwater mountains. Its analysis shows bottom-trawling is being used in regions which harbour particularly sensitive corals. The UN's General Assembly will resume discussions on the issue this week. They are set to conclude on 21 November. "At the very minimum we want an agreement this year to freeze any further expansion of bottom-trawl fisheries," said Matthew Gianni of the campaign group Deep Sea Conservation Coalition. "We also want to see established a reverse burden of proof; that is, you cannot fish on the high seas using bottom gear unless you can prove you are not going to do damage to the ecosystems in which those fisheries will take place." 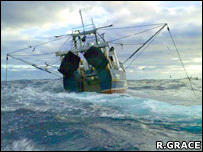 Bottom-trawling uses huge nets armed with steel weights or heavy rollers. 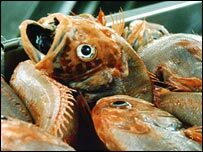 Boats drag them across the seafloor to catch species such as orange roughy, oreos, alfonsino and roundnose grenadier. 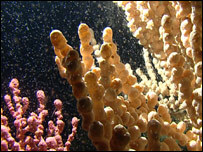 The technique is very effective but smashes everything in its path, ripping corals and sponges from the sea-floor - removing the habitats on which the fish and other diverse organisms depend. It is practised by relatively few vessels - perhaps no more than 200 worldwide - and accounts for about 0.2% of the total world catch. This meant the scale of the destruction was out of all proportion to the gain in terms of the value of the fishery, said Dr Alex Rogers, a senior research fellow at the Zoological Society of London, UK. "It's the equivalent of clearing old-growth forest to collect squirrels. It's a practice on land that just wouldn't be acceptable," he added. Dr Rogers - with colleagues from NZ, Australia, the US and Canada - has prepared a report for the United Nations Environment Programme World Conservation Monitoring Centre (Unep WCMC). It examines the vulnerability of seamounts to destructive fishing practices. Scientists think there may be 100,000 or more of the underwater mountains distributed around the world's oceans. They attract aggregations of the planktonic organisms that form the food base of marine ecosystems. "We call it trophic focusing," Dr Rogers told BBC News. Prominent in these deep - 1,000-2,000m down - ecosystems are vast "forests" of slow-growing corals and the very high densities of fish that are now the target of industrial trawlers. "But if there are species which you really shouldn't fish, these are the ones," said Dr Rogers. "The orange roughy lives for up to 150 years or more; they don't mature until they are 30 or 40 years old; their reproduction is very sporadic; they are very vulnerable to overfishing." The team has compared the distributions of commercially trawled fish, fishing effort and coral habitat on seamounts. This shows a broad band of the southern Atlantic, Pacific and Indian Oceans between 20-degrees and 60-degrees-south where bottom-trawling activities are likely to have a particularly deleterious impact. Campaigners are concerned because vast swathes of this band are beyond the authority of national or regional fisheries' regulation. They want proper management of these gaps established as soon as possible. Most bottom-trawling is conducted by northern fleets from developed nations. The European Union bloc undertakes the largest effort, with Spain operating the majority of its boats.